Sometimes girlandthegrape.com isn’t only about wine and winemaking. Sometimes it’s about living (and yes, eating) in “Wine Country”. Wherever you live and eat, and whether for environmental, ethical or health reasons many of us are asking more questions about how food gets to our table. It’s not yawn-inducing hipster foodie fetishism; it’s about how the choices we make every day affect our bodies, our communities and our world. For the last couple of years I’ve been searching for a better way to get quality food on my family’s table. I wasn’t about to pay the outrageous prices charged at Napa’s boutique charcuterie shops ($13.00/lb for pork chops?) or at the farmer’s market ($9 for a dozen eggs, are you kidding me?). So we started growing our own tomatoes and I found a regular source of backyard-raised eggs on Craigslist.com (I literally slip $5 under the door mat for a dozen). We look for organic or hormone-free chicken and pork as well as grass-fed beef at the supermarket. Yes, we find ourselves spending a little more on meat but overall we consume less quantity and more quality (luckily the kids love tofu). For the last two summers, however, I’ve been stocking up our freezer (and those of friends and family) with what I believe to be the ultimate source of humanely raised, amazing-quality, farm-to-table meat: your friendly neighborhood 4-H club. Alexa taking “Bessy” for a walk. Exercising your animal is a key part of raising healthy meat. For those not in the know, 4-H is national youth-development and mentoring organization with over 6 million members. Kids can participate in a wide array of activities and projects in areas including business, science, health, agriculture and handcrafts. In rural/urban Napa County where I live, many 4-H members choose to raise animals as pets or for market as part of their annual project. Rabbits, chickens, goats, hogs and even dairy cows and horses are shown off every summer at the Napa Town & Country Fair and competition for “Grand Champion”and showmanship ribbons are fierce. I know, it sounds a little weird and involved. Certainly, buying an animal from a live auction is an experience in and of itself and does take a little practice to get used to. Luckily, I had done 4-H as a kid myself and had raised lambs for market so knew a bit about “how to do it”. And this year, since I couldn’t be at the auction for the whole day, I had a friend (a mom whose daughter was at the fair showing rabbits and goats) kindly volunteer to do the final bidding for me. 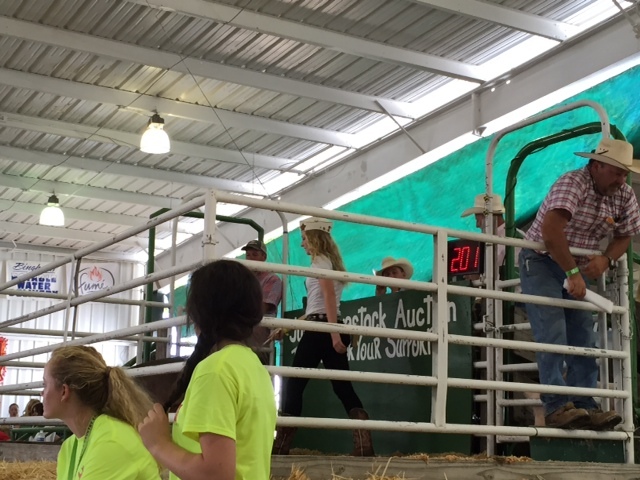 Alexa strides confidently into the auction ring (Bessy is just out of sight in front of her). 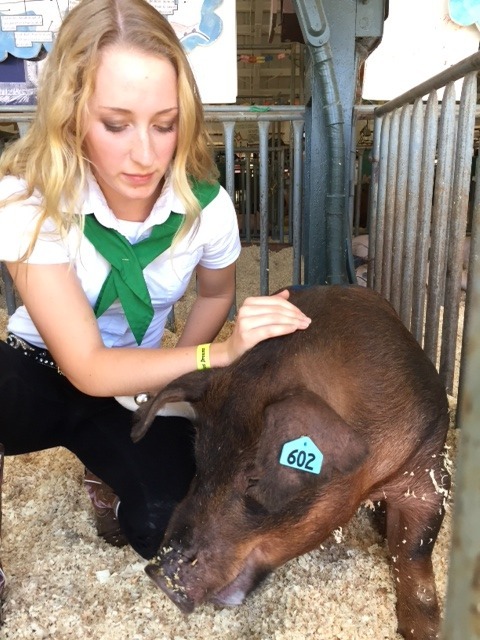 After the bidding was done, we were excited to have purchased Bessy, a pure-bred Duroc hog, from Alexa Butts, an 18 year old Napa 4-H member who has raised hogs for auction for the last three years. Yes, paying $5.00-$8.00 a pound for an entire animal that can weigh over 200 pounds is a big upfront investment. If you get together friends and family, however, you can form your own kind of “buying club” and make it affordable for everyone. It’s About More Than The Meat…..
One of the best parts about buying an animal directly from a 4-H member is that you can get to know who raised your animal as well as how. 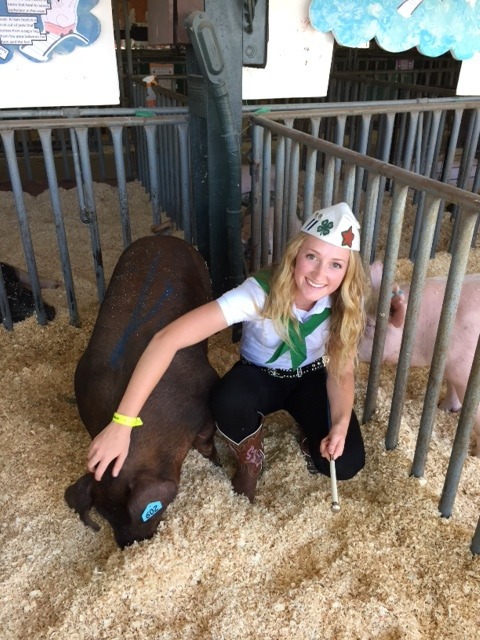 Alexa told me all about her experience in 4-H this year. She bought two pigs (one a Duroc, Bessy, and the other a “Cross”) from a specific breeder, after much research. “Durocs,” she says, “are considered one of the tastier market hogs.” She described some of the work involved. “You have to feed them, bathe them (on occasion), clean their pen and most importantly practice showmanship,” which prepares you and your animal for final judging in the ring. Alexa admits, “It is hard to say goodbye” but she knows going in that these pigs are for market. Eating meat, not to mention eating meat that you’ve actually met, isn’t for everybody. Animals raised for food consume a large percentage of the world’s resources and yes, we should all be eating a lot more plants. Animal or vegetable, however, there’s something very special about closing the circle between what’s on your plate, where it came from and what it took to get it there. Teaching my two young sons about where our food comes from, whether from a row-crop farmer in the Salinas Valley, our own garden or literally from “a girl next door”, is a valuable lesson in and of itself. Thanks, Alexa, for all your hard work and thank you, Napa 4-H! Alison Crowe is the Director of Winemaking for Plata Wine Partners and Winemaker for Picket Fence Vineyards, Garnet Vineyards and others. She sources from vineyards all over California for her clients’ projects and lives in Napa with her family and is an alumna of the Carpinteria Valley 4-H Club. 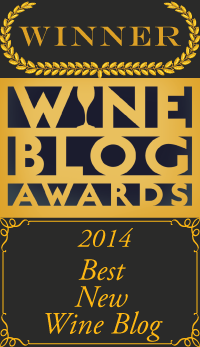 Girl and the Grape won “Best New Wine Blog” in 2014. Reach her at LinkedIn, @alisoncrowewine ,ancrowe@hotmail.com. Photo credits: Tia Butts and Lisa Adams-Walter. Thanks to Lisa for the winning bid!